• Originally codenamed ‘K2’ which some people assume stands for ‘Quark Killer’, Adobe launches InDesign 1.0. It is slow and buggy and quickly boxes start gathering dust on people’s shelves. • Adobe announces that they are giving up on Multiple Master fonts, citing a lack of customer interest as the main reason behind the move. The company continues to sell its existing catalog of Multiple Master fonts until early 2003. • Apple introduces Mac OS 9. • Acrobat 4 is launched in April 1999. 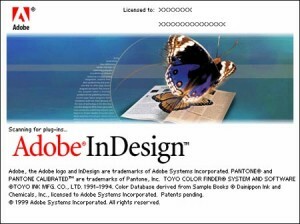 It supports the PDF 1.3 file format, which is the first version of PDF that is really suitable for prepress. By this time, PDF is already the established file format for information exchange with over 100 million copies of Acrobat Reader downloaded from the web. • Heidelberg and Creo announce Prinergy, a jointly developed workflow based on PDF and Adobe Extreme technology. After the fall-out between both companies in 2003, Creo continues the development of Prinergy while Heidelberg launches its own PrintReady workflow. • The Escher-Grad Cobalt-8 is the first violet 8-up CtP system on the market. • Bitstream creates MyFonts.com, a website that makes it easy to find, try and buy fonts online. • Font company Agfa Monotype is created. A year later it acquires ITC, International Typeface Corporation, and become the largest type vendor in the world. • Palatino Linotype is an updated version of the typeface that Hermann Zapf created in 1948. It includes extended Latin, Greek and Cyrillic character sets. • Turkey is hit by a very heavy earthquake of magnitude 7.4. • War erupts in Kosovo as well as East Timor. • Stanley Kubrick, the director of ‘Dr. Strangelove’, ‘2001: A Space Odyssey’ and ‘A Clockwork Orange’ dies. • The number of Internet users worldwide reaches 150 million. • Panic breaks out over the possible dangers of the Y2K bug.